The JCRA finally got rid of that interim director, plus they got a full time director of development! The inside scoop is that I have accepted the offer to be the director of the JC Raulston Arboretum, and Anne Porter's responsibilities are also changing to make her a full-time director of development for the JCRA. We are excited! These changes provide us with a point of reference to reach forward to our future, try some new things, act on some new ideas, and advance the mission and the fiduciary stability of the JC Raulston Arboretum. The "we" in all of this involves our dedicated staff, plus our volunteers' gifts of time and talents, and the generosity of so many avid gardeners and the Friends of the JC Raulston Arboretum. Our recent past has been busy! The Japanese Garden renovation and new stone walkways were completed just in time for a grand opening on May 2 at our Gala in the Garden. We were sad that Donald Moreland, Ph.D., passed away just before the renovated Japanese Garden was completed. Before his passing, Don provided the funds to install the walks in memory of his beloved wife, Verdie. The handcrafted stone pathways really are beautiful, and form the centerpiece of this tranquil garden. The new Lath House construction began in August and will be completed in October. The elegant design was created by Frank Harmon Architects of Raleigh. With the construction of the Lath House underway, we delayed development of the Ellipse in the center of the Arboretum. The Master Plan team used this time to embellish some of the previous design ideas, and we look forward to a truly magnificent Ellipse project in 2011. The new Annual Color Trials location is a panorama straight off the color chart. The sweeping lazy curve of planting beds forms a rainbow of colors across the landscape. For the first time, we have a container trials area as well, and each color crop entry is watered independently to assure top performance. Our programs and events held during the spring of 2010 were well attended and very successful. The Friends of the Arboretum Lectures continued to offer great speakers for enthusiastic attendees. Mark Weathington's Plantsmen's Tours held the first or second Tuesday of each month provided entertainment and lots of plant knowledge to an entourage of eager learners. We estimated that over 2,000 folks visited the JCRA during the News & Observer Birdhouse Competition held April 10 and 11. In conjunction with the Birdhouse Competition, we held our first ever JCRA Plant Sale that raised $14,442 in plant sales and brought in 32 new Friends of the Arboretum memberships. 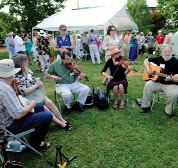 The Gala in the Garden was again a very big success for the JCRA. Approximately 600 people attended, not counting Alice, a white rabbit, and a mad hatter or two. 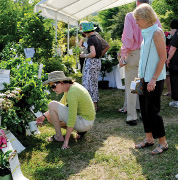 Our total net revenue for the event was more than $80,000—providing critical support for the Arboretum's daily operations, garden collections, research, and public outreach. We also hosted the Landscape Field Day in May and the Color Plant Field Day in June, both well attended by landscape and green industry professionals. Our upcoming schedule includes a new lineup of interesting FOA Lectures and Plantsmen's Tours in addition to other exciting programs. The International Plant Propagator's Society Southern Region meeting is in Raleigh this year, and they visit the JCRA on October 12 for dinner and a Question Box. It's sure to be an exciting journey, and we are glad that you are going with us. July 2010 was "Smart Irrigation" month for North Carolina, recognized by Governor Beverly Perdue in a proclamation recommended by the North Carolina Green Industry Council. The Green Industry's Smart Irrigation program is part of the Water Wise Works public education campaign partnership with the North Carolina Department of Agriculture to place smart controllers in public gardens across the state. The JC Raulston Arboretum has just received a 30-station smart controller valued at $4,000 to be installed in the Annual Color Trials. This is the second smart controller provided to the JCRA as part of the public education campaign. Smart controllers determine plant water requirements based upon plant types, soil types, and soil infiltration, plus five environmental factors, including: precipitation, solar radiation, temperature, humidity, and wind velocity. Today's weather determines tomorrow's irrigation needs. They save water by applying it only when it's needed. Smart controllers are "Water Wise" and they "Work" by using environmental conditions and plant water needs rather than an arbitrary clock setting. The JCRA extends a big thanks to the North Carolina Green Industry Council for making this possible. Ted Bilderback, Ph.D., has been appointed director of the JC Raulston Arboretum effective July 1, 2010. He has served as interim director since January 1, 2009. Ted is the fourth director of the Arboretum since it was established in 1976. Ted is a professor in the Department of Horticultural Science, where he began his academic career in 1977. He worked closely with J. C. Raulston in the early years of the Arboretum's development and Ted's students were responsible for planting many of the older specimens in the collections and the older holly border. Ted served as a nursery Extension specialist from 1987 to 2009, working in close collaboration with the nursery industry. He continues to serve as an educational adviser to the North Carolina Nursery and Landscape Association. His research led to the development of cost-effective and environmentally-conscious cultural practices for growing nursery stock, with emphasis on container substrates, irrigation practices, and plant and substrate nutrient levels. His research investigations have included 24 graduate students and resulted in 57 scientific papers and a total of 541 published articles. His Extension programs introduced new technologies to the nursery industry through county horticulture agents via distance education courses and to the nursery industry through many workshops and popular nursery publications. Ted is married to Linda Bilderback and they have two adult sons. The May grand opening of the fully renovated Japanese Garden, which was funded by the late Donald Moreland, Ph.D., in memory of his wife, Verdie, was greeted with excitement by staff, members, and garden visitors alike. While retaining much of the feel of the original design, many new features were added to create an entirely new garden. The long boardwalk was mostly removed, leaving only a viewing platform. An incredible nobedan-style stone pathway leads from this platform and allows for many views and vignettes as it runs along the east side of the garden. Of special excitement is the development of the southern portion of the garden which had been filled with seedling mahonia and liriope. The NC State University chapter of Pi Alpha Xi, a horticultural honor society, generously donated funds to create a new gate in this area for an exit from the Japanese Garden to the Asian Valley. New renovations mean new plants, and the Japanese Garden is full of some exciting additions to the JCRA. We're always interested in truly novel Japanese maples, and one of the most exciting new forms in recent years is the first ever strict weeping, non-dissectum form called Acer palmatum 'Ryusen'. This plant would happily form a ground cover if it were not staked upright. The cascading effect of the green foliage, which turns burgundy in fall, is quite graceful and it serves to anchor the spirit bridge and it becomes a focus in the foreground of the garden. Another tree which we are excited to be able to display is the outstandingly variegated Styrax japonicus 'Frosted Emerald'. Who needs flowers with foliage like this? 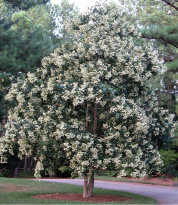 Big splashes of brilliant white on a background of deep green make this tree a show stopper. In full sun, the foliage is splashed and dappled while more shade brings on even larger patches of white. This is a West Coast plant and probably needs some protection from the more intense sun on our side of the country. Based on the amount of variegation, we're guessing this is a slow grower. One of the more unusual types of variegation, much loved by the Japanese and less well known here, is often called ghost variegation or viridescence. Plants showing this characteristic emerge white and become green over the course of the summer. The new Pittosporum tobira 'Mountain of Snow' is a wonderful evergreen shrub showing this unusual pigmentation. The glossy, dark green foliage provides the ideal backdrop for the pure, creamy white new growth. As the summer heats up, the foliage becomes more and more green until finally becoming pure jade, just like the snow melting from the top of a mountain. We're always excited by new enkianthus, which are truly among the aristocrats of shrubs with loads of urn-shaped spring flowers and brilliant fall color. We were especially thrilled to find the latest selection, Enkianthus campanulatus 'Kisoji no Haru'. This form is so new that there is some disagreement over whether it is wide spreading or narrow. Based on what we can tell, it looks to be a compact, upright grower, though. The flowers are deep brick red and exceptionally showy. Another great shrub is the variegated Japanese beautyberry Callicarpa dichotoma 'Shiji Murasaki'. Unlike other beautyberries, this form rarely sets fruit, but the heavily speckled and splashed foliage carried on pink stems is truly spectacular. We've grown ours in full sun and it takes the bright light with no problem. This plant is floating around under several names, but we think this is correct. Ground covers also have their place in the Japanese Garden and we think Juniperus conferta 'All Gold' is one that will become a widely popular plant. The spreading foliage is fairly vigorous and as its name says, it is all gold. Shore juniper is one of the more shade tolerant of ground-covering junipers and is salt tolerant, making it an excellent choice for the coast. If you prefer flowers on your ground covers, the creeping Rhododendron 'Fuzzy' may be the choice for you. This Polly Hill hybrid between R. nakaharae and R. oldhamii grows to less than 1' tall, but spreads to 4'. Every leaf and stem is covered with dense hairs and the late flowers open orange-red with a deep red blotch. As Don Moreland often said, the Japanese Garden should be a place of serenity where the plants can stand out as part of a harmonious whole. Although he wasn't able to see the grand opening, we think he would have been very pleased with the finished result. In 2007, we began to plant the Geophyte Border just to the east of the A. E. Finley Rooftop Terrace. This area had been left bare for some time and it was great to have a new garden designed by Doug Ruhren. Since that first planting, the plants have had some time to settle in and fill the once barren area. I have learned a bit about growing many geophytes since then and thought that I might tell you about a few groups of note from the summer Geophyte Border. Dahlias are a group of about 35 species of herbaceous plants in the Asteraceae family, largely from Mexico, along with a few species in the mountains of Central America and Colombia. Close relatives include Coreopsis, Cosmos, and Biden. They are known for their large, colorful inflorescences and are included in the border because of their large tuberous roots that help them cope with cool, hot, or dry periods. A few species grow in the border, including Dahlia imperialis and Dahlia coccinea, but we grow several other hybrids. Bronze to black foliage adds to the show of many of the hybrids in the border, making the colorful single-to-full double inflorescences stand out. A few cultivars of note include Dahlia 'Knockout', a 4' tall, beautifully cut black-foliaged cultivar with clear, single yellow inflorescences that are sometimes blushed with bronze; Dahlia 'Bishop of Llandaff', a 3½' tall, glossy black-foliaged cultivar with semi-double red inflorescences; Dahlia 'Classic Giselle', a 5'–6' tall, bronze-foliaged cultivar with single inflorescences of burgundy fading on the edges to pale purple; and Dahlia imperialis, a 6'–12' tall giant grown for bold foliage only, showing large clusters of lavender inflorescences in late October and November only if we have a late first frost. I have found that the cultivars with bronze to black foliage tend to hold up through the heat of the summer and do not go dormant. The green cultivars often will die back in the heat of mid-summer, taking advantage of those tuberous roots, then recover in the late summer to early fall to give a good show. Crinums are a group of about 180 species of large Amarylids that are found throughout the tropics and subtropics, with the largest concentration being from southern Africa. Numerous hybrids and selections have been made for hardiness, flower color, foliage color, and fragrance. Crinums are known for out-living their owners and can be found growing near the locations of long-gone farmsteads in the Southeast. Hybrid crinums grow throughout the border, providing intermittent flowers starting as early as late March and continuing until October and sometimes early November. All crinums in the border are of hybrid origin; the following are just a few of note. One of the most common of these, Crinum ×powellii, is a hybrid of C. bulbispermum and C. moorei. The cross has been repeated many times and has resulted in plants with varying flower size, longevity, and colors of pink to white; some have been given cultivar names. The main show of flowers held on 3'–5' stalks comes in late spring to early summer, with sporadic flowers throughout the summer and fall. Crinum 'Alamo Village', one of the earliest and longest flowering cultivars in the border, perfumes the border with pale lavender, open-faced flowers. Scapes reach only about 2½'–3' tall, allowing plants to be closer to the front of the border and appreciated more closely. If you like foliage, Crinum 'Sangria' provides burgundy leaves that act as an exclamation point in the mix of otherwise green leaves. Pink flowers poke out from the bold foliage as well. This hybrid, which included the tender burgundy-leaved C. procerum 'Splendens' as its seed parent, gets its hardiness from an unknown C. bulbispermum hybrid. My favorite in the border is C. 'White Queen'. This very large, slowly multiplying crinum makes up for its slow growth by decorating itself with very large, pendulous, white bells. Luther Burbank created this magnificent beauty. There are two very closely related genera in the border commonly called rain-lilies, Habranthus and Zephyranthes. The two genera are distinguished by the stamen arrangement (Habranthus have three short and three long stamens while Zephyranthes have six stamens of equal length) and how the flower is held on top the scape (Habranthus are held at a slight angle). The species originate from southern United States south to Argentina. They are called rain-lilies due to the fact that many respond to spring and summer rains by giving us a flush of flowers within days of a heavy rain. Some, though, are more seasonal in their flowering time. All have low-growing, thin to strappy leaves that range from dark green to blue-green in some species. The border includes about 25 different species and cultivars. Flowering begins as early as late March and may continue until as late as October. The flowers range in size from less than one-half inch to about 4" across and include whites, creams, yellows, pinks, and even orange. Of those in the border, the earliest one to flower is Zephyranthes drummondii, beginning as early as late March and continuing sporadically until mid-summer. This is one of the largest flowered species, with white blossoms measuring 3"–4" across. The nearly evergreen, blue-green foliage adds to the display and gives it a presence throughout the year. Shortly after Z. drummondii starts, Zephyranthes primulina pushes its pastel yellow flowers from between thin, dark green leaves. It is one of the freest flowering and dependable, throwing out flowers April to frost. Habranthus robustus, another large-flowered species, begins in May and will repeat several times over the summer months. It holds large, 3"–4", zygomorphic (bilaterally symmetrical) flowers above gray-green foliage. Early to mid-summer brings the widest variety of species and cultivars in flower. Zephyranthes 'Labuffarosea', wild collected by John Fairey of Peckerwood, has flowers that range from white to shades of pink. Selections of Z. 'Labuffarosea' in the border include Z. 'Confection', with 4" flowers having petals it can't hold up, so they droop at the tips; Z. 'Itsy Bitsy', with thin, white petals on a flower that is 1" across; and Z. 'Lily Pies', with large, white petals fading to pink at the tips. One of the last to begin flowering each year is Z. candida. Native to Argentina, Uruguay, Chile, and Paraguay, this species begins flowering in late July or early August with flushes of flowers that cover the foliage. If you like cut flowers that last and last and last; try growing some Eucomis, commonly called pineapple-lilies. They are natives of floristically rich southern Africa. There are about eight different species and cultivars growing among the other geophytes in the border. Cousins of the hyacinth, they contain alkaloids that protect them from being eaten by most herbivores, including our favorite, the vole. The flower stalk looks like a tall hyacinth with a tuft of foliage on top. These strange plants can be propagated by leaf cuttings, making them easy to multiply. The earliest to flower is Eucomis autumnalis. It begins flowering in June and remains attractive throughout July. The 15" tall inflorescence poke up from between the succulent strap-like foliage and are covered in white flowers that age to green. Eucomis comosa is represented by two cultivars in the border, both growing to about 2' tall. One is a light pink cultivar, Eucomis comosa 'Peace Candles'; the other is the ever-popular burgundy-leaved and burgundy-flowered form that was found in the 1980s growing at the North Carolina State Fairgrounds, Eucomis comosa 'Sparkling Burgundy'. Both begin flowering in late June and continue through July. If you don't have space, the diminutive Eucomis vandermerwei is for you. It tops out at just about 6"–8". It has purple-splotched leaves and a little purple pineapple growing from the rosette of leaves. Now, if you have lots of space, Eucomis pole-evansii may be what you want. It is reported to grow to as much as 4'–6' tall, but 3' is normal. All of these do well in full sun or light shade in well-drained soil. Oriental-trumpet lilies are planted along the back of the border to provide height, color, and fragrance. These lilies are the result of breeding that uses techniques that are beyond basic hand pollination. Oriental lilies and trumpet lilies are far enough apart genetically that crosses won't take or survive on their own. As a result, methods such as embryo rescue and other methods that trick the seed parent into accepting pollen that is not compatible have been used to create these beauties. Thank goodness breeders have been able to accomplish this. The results have been spectacular, vigorous, strong-growing cultivars that are often tolerant of more cold, heat, and dry soils and still give beautiful flowers. They flower for us here during June and July, providing color for weeks. They are great for cutting as well, so they can be brought into the house to be enjoyed. Six-foot-tall stalks of yellow trumpets cover the top third of one of the early flowering cultivars called Lilium 'Yelloween'. Beside it is one of the tallest-growing, late-flowering cultivars called L. 'Scheherazade', offering a cream flower with a broad, deep burgundy stripe on each recurved petal atop the plants. Other colors of rosy pink can be seen on L. 'Robina', which has wide flowers much like its Oriental lily relatives. Other colors are in the "antique" shades, including L. 'Red Hot' with flowers that are yellowy cream flushed with rose. Great advances are being made in this group of lilies, so keep an eye out for these in bulb catalogs. Try some! These are just a few of the plants in the Geophyte Border that you might want to grow in your own gardens. Many more earthly treasures can be found if you take the time to look at the border on your next visit. Sonia Murphy, College of Agriculture and Life Sciences' director of gift planning, will lead a special workshop titled "Your Estate—Your Plan—Your Legacy." If you are not able to attend this workshop, Sonia is always available to answer your gift planning questions by contacting her at (919) 513-0637 or sonia_murphy@ncsu.edu. If you would like to see what others have done, please visit http://cals.giftlegacy.com, where real donors talk about their planned gifts and what it means to them. For more information on this or other giving opportunities, please contact Anne Porter at (919) 513-3826 or anne_porter@ncsu.edu. Or, visit http://www.cals.ncsu.edu/advancement/. We sincerely thank you for your investment in the JC Raulston Arboretum. Your membership gifts are critical to the success of the JCRA, as they directly support its daily operations, its collections, and its mission of research, education, public outreach, and green industry partnership. While many public gardens charge an entrance fee, the JCRA is open free to the public 365 days a year. Not only are you and your family able to enjoy the beauty and tranquility of the gardens, but your support is also helping to provide this outstanding community resource to all visitors—touching friends from around the world! What's In It for Your World? A living outdoor museum, providing a greener, cleaner, more beautiful world. The late J. C. Raulston, founder of the Arboretum, said it best—"Plan—and Plant for a Better World." Your membership is helping to do just that! Just imagine the possibilities if each current member brings a new member. So share this little piece of horticultural heaven, and bring a new visitor to the JCRA and encourage them to join today! Featuring pictures, stories, and testimonials from JCRA members who are getting the most out of their membership. When we returned to Miami after spending a week cruising the Caribbean, we decided to visit the wonderful Fairchild Tropical Botanic Garden. Since we had our JCRA membership cards, we took advantage of the AHS's reciprocal admissions program benefit and received free admission—a $15 value for each of us! I highly recommend checking out the AHS Web site when you are traveling. JCRA benefits can save you money, and you might even find a new garden to visit for free! At the 1998 members' plant give-away, I picked this Emmenopterys henryi (Chinese emmenopterys). It was about nine years before it bloomed the first time, but look at it now—spectacular! JCRA members, we want to hear from you and see your plant "babies" all grown up, so please send your pictures, stories, and/or testimonials to Anne Porter or Judy Morgan-Davis today at anne_porter@ncsu.edu or jvmorgan@ncsu.edu. The JCRA is extremely fortunate to have so many talented friends and donors. If you are a "member making news" or know of one, please let us know, so we can share your good news with our JCRA friends. Did you know that Ted Bilderback, Ph.D., has been named director of the JC Raulston Arboretum? Now this is one member making some very happy news! We are all thrilled by your new, official appointment, Ted! Have you tuned in to Helen Yoest's new radio talk show on WebTalkRadio.net? If not, you really should! Here are the URLs for Helen's interviews with two other JCRA members making news—Bobby Ward's Chlorophyll in His Veins: J. C. Raulston, Horticultural Ambassador: http://bit.ly/db4MzI and Roy Dicks's Rhapsody in Green: http://bit.ly/aVEv3e. Well done, Helen! Anne Clapp has been a radio personality for more than twenty years, permanently co-hosting the Weekend Gardener on NewsRadio 680 WPTF with Mike Raley since March 1992, on Saturday mornings from 8:00 AM to 11:00 AM. Mike began hosting the show in 1985 when it started as a 30-minute "call-in" program. It became a one-hour show a year later and then increased to two hours in 1991. Mike and Anne teamed up to do a three-hour show beginning in 1998. Bill Friday, Ph.D., is a regular listener of the Weekend Gardener, so Mike and Anne were asked to be guests on his Carolina People TV show. The show was filmed at the JC Raulston Arboretum and was great promotion for the Arboretum. Keep up the great work, Anne and Mike, and keep sending your listeners to visit the JCRA. Jerry Glenn received the President's Council on Service and Civic Participation Award and the Unsung Hero Award for his volunteer work at the Northern Wake Senior Center and the JCRA. Congratulations, Jerry! The 2010 Gala in Wonderland was indeed a wonderland experience. Thanks to honorary chairs, Nina and Jerry Jackson, and event chair, Sylvia Redwine, plus all the dedicated and talented members of the Gala Committee, guests were transported to an enchanted world of botanical beauty. 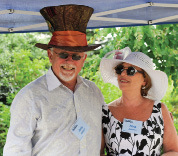 The Gala is the Arboretum's main fund-raising event of the year; and the support generated is critical to the daily operations and success of the JCRA. The 2010 Gala netted more than $80,000, thanks to the generosity of our sponsors and all the guests who attended this year. The Gala also gave Chancellor Randy Woodson, Dean Johnny Wynne, and Ted Bilderback the opportunity to thank and pay tribute to some very special donors who have supported the Arboretum's Master Plan initiative, including: horticulture alumni Mitzi Hole and Michael Stallings, who have given generously in support of the new Lath House; the late Charles Larus, whose gift created the new Charles T. and Ethel T. Larus Endowment for the JC Raulston Arboretum; and the late Donald Moreland, who helped support the Japanese Garden renovation in memory of his late wife, Verdie Moreland. The garden reopened on the day of the Gala. It's never too soon to mark your social calendars for the most popular garden party in Raleigh! For more than 15 years, the Gala has always been held on the first Sunday in May, so mark your calendars for Sunday, May 1, 2011, at 3:00 PM! Our spring events kept our staff and volunteers very busy. Beginning with A Walk in the Winter Garden and ending with Gala in the Garden, our volunteers kept things humming smoothly. In between, we had our first ever plant sale, the N&O Birdhouse Competition, and our FOA Lecture series. We now have over 200 volunteers who help us keep the Arboretum looking beautiful and helping with our events. In the last six months, we have welcomed 29 new volunteers. We are delighted to have such a hardworking, dedicated group of volunteers. Do you have an extra pair of pruners you don't need or a shovel you never use? The volunteers are in need of garden tools if you would like to donate any. We need pruners, weeders, trowels, rakes, shovels, and five-gallon buckets. Jeff Evans and Harriet Bellerjeau gave a presentation at the Volunteer Brown Bag Lunch on the progress and plans of the Master Plan Committee. The Construction Team is a new group of volunteers who work on repairing fences, building walkways, and other projects. Dave Duch and Walt Thompson are working in the Japanese Garden. Next up is the Necessary! Our volunteers in the Finley-Nottingham Rose Garden, CJ Dykes, Anne Clapp, and Gail Beasley, come every week to make sure the roses are doing well and looking beautiful. The Winter Garden is maintained by the Raleigh Garden Club. Pictured here are Alberta McKay, Judy Allen, Helen Yoest, Laura Wright, Barbara Harvey, Judy Bradyhouse, and Melanie Kelley after a morning of work. Many of our volunteers help with our lectures by checking guests in and setting out refreshments. Lynn Canada, Vandy Bradow, and Mary Lou Shankin get ready to welcome guests.